We are writing you this letter to express our concerns for the health of the lodging industry and the property tax base that the current hotels in McCook represent. At this time there are five hotels with collectively 243 rooms (88,695 rentable rooms per year). With an additional 54 rooms being added by the Cobblestone Hotel to the market (19,710 annually) there will be 108,405 rentable rooms per year in the City of McCook, an increase of 22 percent. Another 75 rooms (estimated for this analysis) from the second proposed hotel development will add 27,375 more rooms per year (now totaling 135,780 annually) or a 53 percent increase in lodging capacity for the City of McCook. This will create an unsustainable situation and will eventually result in the loss of between 60-90 hotel rooms that currently pay property taxes in our community. The five current hotel properties in McCook pay a combined $99,329.34 in property taxes each year (not including personal property taxes). $99,329.34 is not an insignificant sum in our opinion (See Exhibit A). Each hotel room in our community pays on average $408.76 annually in property taxes. A loss of 60-90 hotel rooms equates to between $24,525.56 and $36,788.40 annually in lost property tax revenue for the City of McCook. As we know, because of Tax Increment Financing the new hotel developments will not pay any additional property taxes for a period of 15 years. For two new hotels to have this advantage over the current taxpayers seems inherently inequitable. For the calendar year 2015 the five hotels in McCook generated $3,594,608.50 in total revenue with an average occupancy rate of 56 percent and an average daily rate of $72.50. (See Exhibit B). By today's standards the average traveler for either business or leisure would consider hotel rooms in McCook a bargain. We have determined that the McCook hotel market is 80 percent business travelers (including construction workers) using 42,930 rooms per year, 10 percent leisure travelers (those coming here to play golf, hunt, fish, attend athletic events of simply traveling through) using 5,366 rooms per year. The remaining 10 percent are the one-time travelers who come to McCook for an event such as a wedding or a funeral. The following is an analysis of the current, soon to be and potential effects of the second proposed hotel development on the lodging industry in McCook. 1. Currently a 56% occupancy rate equates to 135 sold rooms per night and 108 vacant. This situation provides each hotel a chance to be sustainable. 2. With the addition of the Cobblestone Hotel. 54 rooms, 19710 annually. This situation will essentially create a less than break even scenario and each hotel will have to respond accordingly. This situation will be unsustainable and the current lodging industry in McCook will be forced to reduce their inventories. The end result will be the loss of 60-90 rooms in order to reach at least some level of managed sustainability. 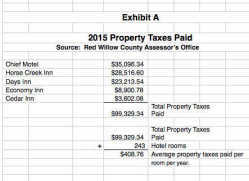 Every hotel room lost reduces the amount of property taxes collected by the City of McCook. More hotel rooms will not equal more hotel stays. Without any additional market drivers such as new industries, increased construction, or leisure opportunities, there is no reason to believe that McCook will have additional travelers. To base projections of increased occupancy or the need for additional hotel rooms in a market place on information from travel websites is a false premise. Travel websites such as Orbitz, Travelocity, Hotels.com, Trivago and others operate as online travel agents. In any particular market they negotiate with individual hotels. If the hotel agrees to participate they will allocate them a certain commissionable percentage of their inventory to that specific site. When and if those rooms are sold the site will indicate ROOMS NOT AVAILABLE. This is intentional. If a hotel chooses not to participate the site will also show ROOMS NOT AVAILABLE. This is also intentional. The phrase ROOMS NOT AVAILABLE implies to the viewer the hotel is sold out and redirects them to participating hotels with remaining inventory. These are not accurate indicators of occupancy in any market. Months of declining occupancies. In 2015 occupancy was down 13 percent and is down 10 percent so far in 2016 (See Exhibit C). The market place for lodging in McCook will also be affected by the other new Cobblestone Hotels built in Cambridge of 31 rooms (11,315 annually) and in Oberlin KS, 31 rooms (11,315 annually). The presence of the new Cobblestone Hotel in Cambridge is responsible for at least 10 percent of the occupancy decline we have already seen. In 2015 Furnas County increased their lodging tax receipts from $10,333.28 to $24,650.65, a 238 percent increase. 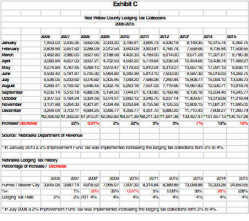 Collected at 4 percent this increase represents an additional $357,934.25 in lodging receipts (See Exhibit C). It is safe to say the majority of those room nights would have been sold here in McCook. The new Cobblestone Hotel in Oberlin opened March 4, 2016 and will only add to the decline. Historically there are four events per year in which we can expect the entire town to be sold out. These four events are Mother's Day/Graduation Weekend, Heritage Days, the McCook Farm and Ranch Expo and the Lady Rebels Softball Tournament. These four events only represent a total of 8 nights per year, but the Cobblestone Hotel will alleviate that concern. From 2008 until 2015, the McCook lodging market has benefited from a continuous construction environment. We saw the McCook Community Hospital undergo a major three-phase renovation not including the Anderson Center for Radiation and Oncology. There was also the Armory building, the Public Works/City Offices building, new jail, a major new grain handling facility west of Culbertson, the Delores and Pete Graff Events Center and the renovations of the dorm rooms and new cafeteria for the McCook Community College. We also benefited from the oil exploration and drilling boom. The oil field work was a big market driver although it only lasted a brief a time. There are no projects of any kind similar to any of these slated for our area in the foreseeable future. It is also important to note that McCook and the surrounding areas are primarily agriculture-based economies, as we are all aware. The Sunday Feb 28, 2016 edition of the Lincoln Journal Star reported that due to a three year decline in crop prices, farm income in Nebraska is expected to be at its lowest level in more than a decade. It can also be reported that Valmont Corp. has suspended the majority of their corporate travel for the 1st quarter of 2016. These are two more indicators that will directly have a negative impact on our community and the health of the lodging industry in McCook. The new Cobblestone Hotel in McCook combined with new Cobblestone Hotels in Cambridge and Oberlin (totaling 42,340 additional annual room nights) will already create additional pressure on the lodging market in McCook. 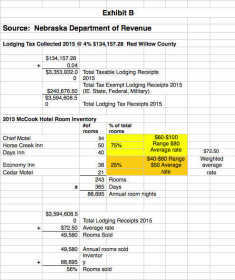 We can expect a continued drop in occupancies, but at least the hotels in McCook that currently pay $99,329.34 in property taxes (and collected $134,157.28  in lodging taxes that benefit our community) will have a chance to survive and continue contributing to the economic welfare of our community. The addition of a second new hotel (27,375 room nights annually) will most certainly erode the current situation and will unwittingly result in a loss of hotel rooms and thus a loss of property tax revenues for the City of McCook. We understand a community's need for economic development, but economic development should not come at the expense of, and jeopardize the health of, an already contributing industry. I strongly urge you to reconsider the proposed second hotel development and decline the Tax Increment Financing option. If you have any questions, concerns or comments please feel free to reach out to us at any time. Is there not such a thing as free trade? If someone wants to put a business in town should we disallow it because it may compete with current businesses? How many food places do we have and have we added to MCCOOK in the last five years? How about car dealerships? Automotive stores, Farm supply stores, on and on. On a personal note, I've had friends and relation try to book rooms in MCCOOK many times in the past and there were none available. I'm thinking that maybe these developers see that and they're addressing the issue. If I owned a motel in MCCOOK rather than writing a letter complaining and blaming TIF for the problem, I would become more competitive, modernize and advertise and stay up with the times. Some just don't want to see progress. Saying no to a multi million dollar project in McCook would be a very difficult call. More jobs building and then running the hotel after construction. Future taxes paid by the new hotel. Again. Hard to say no even understanding the positions of other hotel owners. Paying/Rewarding 'outside' businesses, no matter the genre, and not having to contribute to the funding of the community, plus having the profits being removed from the community, all at the expense of the existing community, in place, seems, to this old citizen, stupidity. I would say more, but, I now, must go to PT, and I may say more about this stupidity after I survive PT. Navy, the community would still continue to receive all the current revenue it receives from the current undeveloped property. Long term that revenue greatly increases. Short term construction jobs, sales taxes, jobs at the facility after completion are all pluses. If memory serves me correctly one of the hotels voicing concerns received city assistance...though not TIF as the city did not have that available at that time. 82er, you are very correct! But, when the new places get a tax break, you are interfering with free trade, you are giving an advantage to the new guy, and disadvantage to the existing business. Just level the playing field, and let economics take care of progress! Worked fine for a long time until some genius thought up "economic development" and started selling their community out with tax breaks.